At Camelot Care we believe that every individual is unique and deserves to be highly valued. Personal choice comes first and each resident merits the very best possible care and attention. We aim to promote each person’s privacy, dignity, individual choice and respect their rights. Camelot Care aims to provide the highest quality of care for an individual that enables them to enjoy and fully explore their interests, hobbies and things that make them happy. We endeavour to make our homes safe secure and attractive places for our residents as well as for family and friends when they visit. We provide what is a wholesome and beneficial experience that comes from community living while recognising that each person is an individual with their own emotional, intellectual, social and spiritual requirements. At Camelot Care we know the best care comes from understanding a person’s specific needs, and our care plans are tailored to each individual. Our care plans are developed by a personal key worker and key carer, and we consult with friends and family about an individual’s history and preferences so that we can develop a unique person-centred care plan. Family and friends are encouraged to participate in an individual’s daily routine and we welcome all suggestions from family and friends about making a person’s stay with Camelot Care a happy and meaningful time. 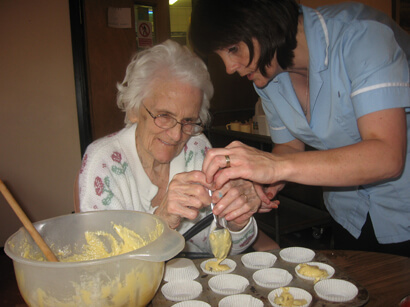 Care plans are continuously reviewed, and close consultation between our activity organisers and nursing staff means an individual always has their needs met and spends quality time with us.